'Women of the 99%' Illegal Robocalls Continue: Where Is the GOP? Regular readers of Big Government know that we have been closely following the largest illegal RoboCall scandal in history. A few weeks ago, several million illegal robocalls were made in at least 23 Congressional districts in 12 states. The calls were made into the districts of Republican Congressmen who also happen to be at the top of the DCCC’s target list. The calls clearly violated federal election and telecommunications law. As we reported, only a sophisticated political operation with very deep pockets could have pulled off such a vast criminal operation. The conspiracy behind the illegal calls warranted a full investigation. It didn’t happen. 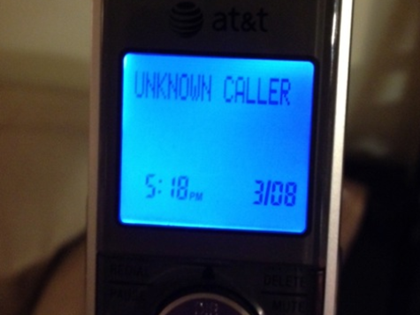 And now it appears the illegal robocalls are back. Big Government has learned that voters in at least 5 states received the illegal calls yesterday: California, Illinois, Ohio, Michigan and Wisconsin. The calls themselves are silly. They try to tie GOP House members to Rush Limbaugh and the media-created ‘war on women’s health’ narrative. What isn’t silly, however, is the deliberate violation of federal law by some national political operation. The brazenness of continuing the calls even after media scrutiny does not bode well for the integrity of the Fall elections. If some organization is willing to blatantly violate the law in March, what will they be prepared to do in October? What’s perhaps more troubling, however, is the non-reaction from the GOP. Neither the hapless NRCC, whose members are targeted by the phone calls, nor the RNC have pushed back on the illegal calls. Neither have pushed for any kind of investigation or public scrutiny. House GOP members, who are the victims of the illegal calls, have also been silent. The GOP controls several committees in the House which could investigate this criminal operation. GOP state officials, who have jurisdiction over many aspects of federal telecommunications law, have also been AWOL. If the GOP won’t defend its members against illegal campaign tactics, then what good is the party? Success in November, in the wake of deliberate criminal campaign acts, will require incredible fortitude and courage. The GOP is sadly lacking in both.